Join us for an empowering workshop that will translate your ideas, thoughts, and dreams into action. Make a collage that represents your dreams, then develop a resumé that will help you bring those dreams to work. Vision Boarding is dreaming out loud on paper. Cultivate clarity on your life goals. 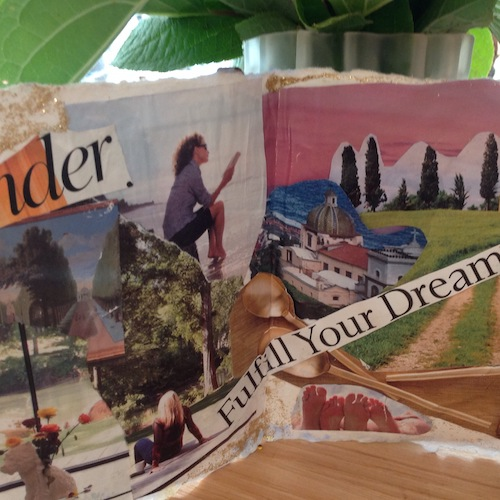 With Terri Severance as your guide, you’ll cut, tear, and glue powerful images into a vivid collage that will help you manifest the life you dream of. Resume Building takes your vision into action. With C. Jane Taylor are you guide, you’ll learn to confidently present your life experience and transferable skills in a resume that will help you manifest the work you dream of. You’ll walk away energized with an inspiring collage that reminds you of the joy and possibility your soul wants to bring into your life. And a resume outline that will help you do it!